Vindale Research Reviews - Legit or Scam? Vindale Research Reviews – Legit or Scam? 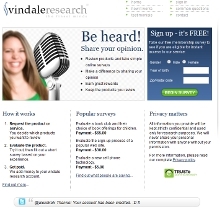 Vindale Research is an online market research company that allows it’s members to earn extra cash in a variety of ways. These days consumer data is a massive business with both large and small firms paying top dollar for any information that could give them a competitive edge. Online Survey companies provide a massive database for these companies to mine from. They build up these databases by providing their members with a variety of perks or cash payouts for each survey they complete. In this seeming win-win-win situation Vindale research gets paid for sorting and maintaining a massive database of shoppers, you can earn extra money in exchange for sharing your demographics and spending preferences, and the company funding the research can improve their product through feedback. After you sign-up for Vindale you will have to fill out information about yourself, this let’s the company categorize you and serve you with the best fitted surveys. Vindale claims to have the highest paying surveys in the industry along with a large frequency of surveys. They are also leading the way in tech by allowing you to participate in surveys on a variety of devices. If you do get selected for a survey and successfully complete it you will be able to claim your cash reward through either a check or Paypal. Vindale also makes a big distinction between them and their competitors by stipulating that their surveys are worth real cash. Many survey companies compensate their users with points that can later be redeemed for cash or prizes. In many cases this can turn into an exploitative situation where the company may change the requirements needed to cash out or users simply give up because of the shear amount of points necessary to reach the payout level. However Vindale claims to have a simple to use payout center where you can earn real money quickly and easily. Their surveys cover a wide variety of topics including everything from vehicles to health & beauty products. In addition to participating in paid online surveys Vindale Research lets you earn through additional avenues. Through all these different methods Vindale claims to have paid out over 5 million dollars in cash. Keep in mind that by opening up yourself to these additional streams you will be subject to offers and ads that will be pitching you products that cost money. If you have any issues with your account, getting credited for surveys, or problems with payments you can reach someone at 1-855-VINDALE (846-3253) or by email at [email protected] If you have technical issues you can also submit a support ticket through their website. Keep in mind that you are only eligible for payouts once you have accumulated $50 in your account and payments may take up to 3 weeks to process. A lot of survey sites generate many complaints for a variety of reasons. Some of the most common are a lack of surveys, not being able to reach payout, or not qualifying for surveys. In many cases these may be legitimate gripes and in others people are expecting too much from this opportunity. Remember doing online surveys is a fun way to make a little bit of money in your spare time – it should not be looked at as an income stream. Often times companies are looking for a very narrow range of people to participate in their studies. These demands can get very specific; ie customers who buy product A 2-3 times per week, have never used product B and have seen an ad for product C.
Survey companies then send out generic questionnaires to their users to see if they can provide people who qualify for the study. This means many times you will not qualify for the survey even though you answered some preliminary questions. If you are interested in surveys there are a variety of online survey companies for you to check out. Some other big names include Swagbucks and MySurvey. You can also look into finding local marketing companies that run focus groups. These are generally more involved but end up paying much better. Average Rating for " Vindale Research " is 2.27 out of 5 based on 169 reviews. I started this month and supposed to receive $20.74 on the 15 of this month. But I have not receive my payment. I have a pay pal account and I tried to call and email them but to this time I have not receive a reply or call from them. But they kept sending me a survey. I am hesitant to continue doing survey, since I have not receive the money I earned. You won't get rich doing survey nor will you qualify for every survey! I do make at least $100 a month doing Vindale surveys, which takes you to other surveys but are paid by Vindale. I am grateful to them for the extra income! Once you reach the $50 mark you choose a check from them or Pay Pal, they pay on the 15th and the 30/31st of the month just like clockwork! As legit as they come. A wonderful way for disabled or house wives to make a little extra money. I do them through out the day and earn money EVERY DAY! Don't listen to these nay sayers, it's a way to give you some extra income and it keeps your mind working! They are not always easy and require thought and your honest opinion about new products, ads, commercial, etc. I have nothing by good to say about them and believe me I've tried most of them. Trust me......you CAN EARN EXTRA MONEY, not credit cards, sweepstakes, etc. Stay with Vindale and you won't be disapointed! I'm very satisfied with them.. There are occasions where you feel like you didn't get paid after a good effort but you just weren't what they were looking for, don't take it personal.... Wishing you will try them and believe me they are not paying me for saying this...I have just made over $200 in the last few months, cashed the checks and know that it has been a tremendous help to my Disability income.. Thanks, Vindale! It has always been good being able to receive my payments, but this is the first time I had to wait 3 or 4 days on my funds because PayPal said you had used an echeck. Normally I have same day access to my money and am able to transfer it to my bank the same day. Why was this payout different. I hope it doesn't happen again. This site is legit. Make some money and have some fun. I spent over an hour taking "preliminary surveys" which ended with one excuse right after another why I didn't "qualify." One survey was actually a bait-and-switch, where they promised $1.75 but instead, after 20 minutes, I was allowed to enter a drawing for $400 off a purchase from some unknown store. Otherwise, I was asked the same questions over and over again only to be told "My profile doesn't qualify" or "this survey has reached its time limit" or some lame excuse. Vindale does NOT answer help inquiries. They flat out ignore you, but continue to send survey invites which end up in a dead end. I am disabled and although I am looking to augment my SSI, I am not looking for a fortune. Just a few extra bucks to help make ends meet. But this is a complete waste of time. I have no idea how they benefit from scamming people in this way but it is infuriating. Don't, I repeat DON'T waste your time with Vindale Research! Every survey I accept to complete, after I complete about half the survey and answer several questions, I get the message unfortunately you don't qualify to take this survey. This has happened on every single one that I have chosen or been led to by a previous survey. At least 10 times. so obviously I don't qualify for any of the surveys. Sounds like a scam to me, asks me a whole bunch of opinions and personal questions, then rejects me, and I haven't gotten paid a dime for my time. I find it hard to believe I don't fit any of the demographics these surveys are looking for. Vindale is a joke. I did cash out once. Since then, I've earned another $30 + but all of a sudden now I get screened out of every single survey for the past..few months I guess?? When I see a new Vindale Research email in my inbox I automatically assume that clicking on it is a complete waste of time. I still click and am constantly disappointed. Also, the rewards for your time are dismal. I've tried taking surveys on this website and others related, but mostly unsuccessful and disqualified to participate in desired surveys. This is rigged system! Completely legit but it does take a while to get to $50 in completed surveys to be able to request payment.